German Pancakes recipe by Alisha Ahmes at PakiRecipes.com. 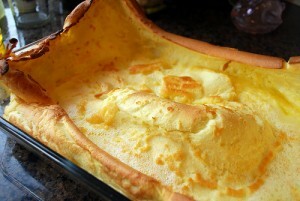 In a blender, combine the eggs, milk, flour and salt ; cover and process until smooth. Pour the butter into an ungreased 13-in. x 9-in. baking dish; add the batter. Bake, uncovered, at 400° for 20 minutes. Meanwhile, in a small saucepan, combine the first five syrup ingredients; bring to a boil. Boil for 7 minutes. Remove from the heat; stir in vanilla. Dust pancake with sugar; serve immediately with the syrup. This is a finish recipe, not German... KROP SU is the real name. I've made this every Christmas morning for the last 31 years!